What: Participate by signing up for a 20-minute time slot at the Mountain Valley District Service Center (Scout Office) using shared computer OR learn how to use any internet electronic device to connect directly to Scoutlink.net to participate. Registration Slots will open up October 1, 2018. Why: It is FUN and you can fulfill requirements for the International Spirit Award. ​Event Contact: More information will be available on the Mountain Valley District Website, at the September and October roundtables, or by contacting MVD JOTI Chair Jason Kovnesky at 579-5409 or jasonkovnesky@gmail.com. WHAT IS JAMBOREE ON THE INTERNET? 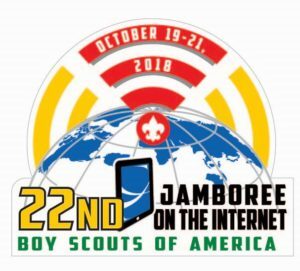 Jamboree-on-the-Internet (JOTI) is an annual Scouting event sponsored by the World Organization of the Scout Movement and is held the 3rd weekend of October. This event utilizes the internet and the numerous devices that are used to get online, from your home computer to iPad tablets, to link Scouts from around the world. Last year, JOTI had almost 16,000 Scouts and leaders registered in the worldwide Jamboree on the Internet (JOTI) database in 146 countries! Scouts of any age can take part, from Cub Scouts to Boy Scouts and Venturers. Scouts can participate at home with the help of an adult, or they can participate in a Scout group at a district-wide event. JOTI is an economical way of communicating around the world. The event allows Scouts to "meet" other Scouts from around the world through the Internet and share more information than just "Hi." The exchanges can include such information as name and location, Scout rank, age, and hobbies. Some exchanges lead to long-lasting friendships. Another great idea is to use JOTI participation to help fulfill a Citizenship in the World or Computers merit badge requirements!